The truth is, I'm not sure when it started. I don't actually think anybody really knows. I've always been fascinated by the Salem Witch Trials, so I couldn't wait to read this book. 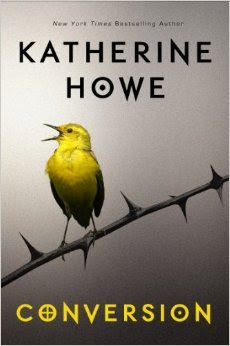 Katherine Howe is an author who has been on my TBR list for quite some time. I remember very clearly when her debut novel, The Lost Book of Salem came out and the immense praise it received. So I knew this book would be amazing and I was so right. Set in Massachusetts, the book is told from two different time periods. The prelude and interludes are told from the point of view of Ann Putnam, one of the girls at the centre of the Salem Witch Trials back in the 17th Century.We hear her story through a confession to the new local priest. The main story is told from Colleen's point of view, in modern day Danvers, which was originally known as Salem Village. As Colleen and her friends face their final months as a senior, a strange and unknown illness befalls the girls in the school. The author used a real mystery illness that happened in a New York school as the basis of the story surrounding these girls. The two time periods are interlinked through the use of The Crucible, a play written by Arthur Miller, about the Salem Witch Trials. From the first page I was hooked. The school had a sinister feel to it before anyone became sick. As the girls fell ill, I struggled to work out if it was all for real or whether the girls might be faking it. Every time a chapter ended on a cliff hanger, I found myself whisked back to the 17th Century, desperate to get back to the present day story. I haven't read a lot about the Salem Witch Trials in detail, but this book has certainly whet my appetite to find out more. This book has a rather creepy aspect to it, because for three quarters of the book, you really don't know what is behind the illness - you can feel the tension and nervousness the girls are feeling as they wonder whether they will be next to succumb to the illness.In the last part of the book, you find yourself realising exactly what is going on. Lots of light bulb moments as information is revealed. Even though this book is a Young Adult book, I think it could easily be considered a cross over. In fact, I think adults might enjoy it even more than teens. There is a lot of information in this book that needs digesting, so it really isn't one to be rushed. It is definitely one I would read again, because I'm sure there are aspects to the plot I might have missed. For anyone interested in witches, the Salem Witch Trials and the town of Salem itself, this is the book for you.